Biker Sunday brings in hundreds of the local residents. The majority of the bikers come from Mason, Meigs, and Gallia counties. 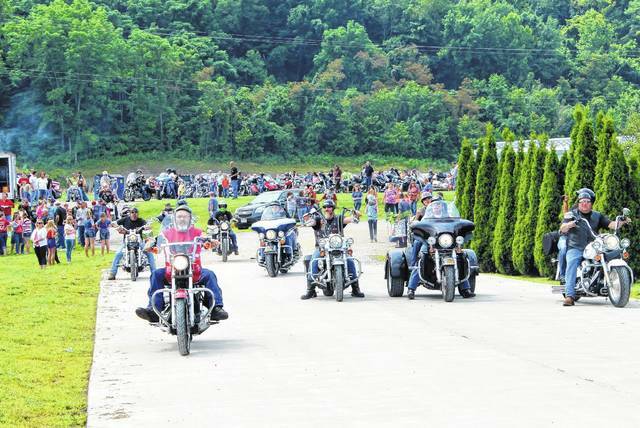 MASON — The sixth annual Biker Sunday will be making its return this weekend. The event is set for Sunday, July 29 at the Northbend Church in Mason located at 500 Adamsville Road. The event starts out with delighting in donuts and fellowship at 9 a.m. Following, at 10 a.m., a church service will be held with Pastor Jason Simpkins giving the message. After the service, there will be a bike parade and a group ride. Once the bikers return, the community outreach will then commence. Throughout the afternoon in the field between the church and the Dollar General Store, there will be several activities and though some of the activities, such as the motorcycle games, are centered around the motorcycles and their riders, there will be activities available to all who attend. Such as, the children will be able to enjoy inflatables provided by Meigs Inflatables. At the event, a free lunch will be served, including Kiser’s Barbecue, side dishes, desserts, and drinks. Sno Biz will be on the grounds to provide free frozen treats throughout the day as well. It is advised for those who attend to bring lawn chairs or blankets for seating. The annual event brings in hundreds of local residents. Though the majority of the bikers come from Mason, Meigs, and Gallia counties, some bikers will venture out from as far as South Carolina. The event is a way to reach out to the biker community. One of the organizers of the event describes Biker Sunday as being a day where bikers can hear the Word and once they hear the Word, then they can begin listening. Though bikers are highlighted in this event, all are invited to attend and enjoy the day as it is a day for community outreach and fellowship. https://www.mydailysentinel.com/wp-content/uploads/sites/14/2018/07/web1_7.26-PPR-biker-sun-2.jpgBiker Sunday brings in hundreds of the local residents. The majority of the bikers come from Mason, Meigs, and Gallia counties.